Lake Mead has dropped 120 feet in the Last 14 years. In 2016 Overton Beach was closed. 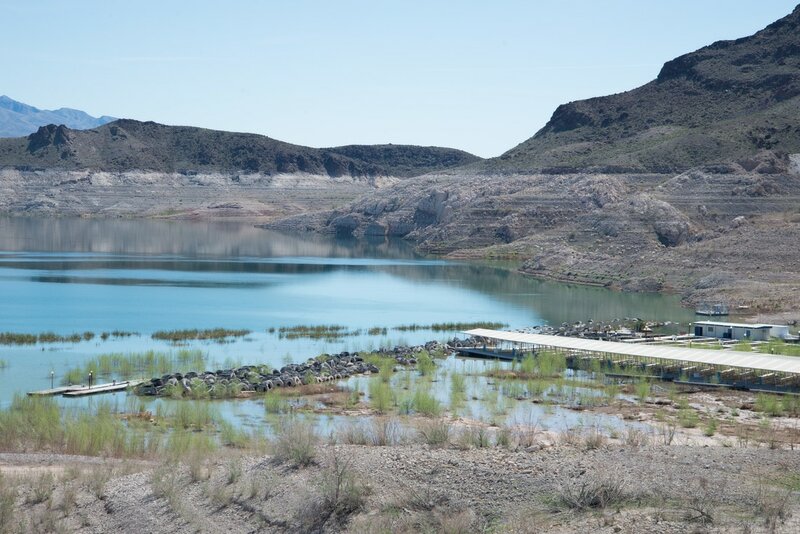 The downward march of the reservoir near Las Vegas reflects enormous strains on the over-used Colorado River. Climate change is adding to the stresses on the river. The problem is not going away and likely to get worse as climate change unfolds, say's experts. Extreme high temperatures in the basin are causing the flow of the river to decline.I was a resident of Las Vegas 15 years ago. I went to Lake Mead often to take in the sites, I would drive over the hill to the marina and see the bright blue full water with red rocks shooting out, a breathtaking adventure for someone who grew up on the east coast. In 2016 I returned to photograph the area only to find small pools in the distance around Callville Bay and several beaches and marinas closed.